Tomorrow, we will have a look at a portion of North Carolina, which knew the hand of Great Britain in forming its boundaries. Today, we look at one of those who claimed part of the North Carolina as his own. John Carteret, 2nd Earl Granville, 7th Seigneur of Sark, KG, PC (22 April 1690 – 02 January 1763), commonly known by his earlier title as Lord Carteret, was a British statesman and Lord President of the Council from 1751 to 1763; effectively leader of the country when Spencer Compton was Prime Minister. The family of Carteret was settled in the Channel Islands, and was of Norman descent. John was the son of George Carteret, 1st Baron Carteret (1667–1695), by his marriage with Lady Grace Granville (3 September 1654 – 18 October 1744), daughter of John Granville, 1st Earl of Bath (29 August 1628 – August 1701). On his mother’s side of the family he was a descendant of the Elizabethan admiral Sir Richard Grenville, famous for his death in the Revenge at the Battle of Flores. John was Seigneur of Sark from 1715 to 1720 when he sold the fief. He held (in absentia) the office of Bailiff of Jersey from 1715. John Carteret was educated at Westminster School, and at Christ Church, Oxford. Jonathan Swift says that “with a singularity scarce to be justified he carried away more Greek, Latin and philosophy than properly became a person of his rank”. Throughout life Carteret not only showed a keen love of the classics, but a taste for and knowledge of modern languages and literature. He was almost the only English nobleman of his time who knew German, which allowed him to talk with George I, who spoke no English. Walter Harte, the author of the Life of Gustavus Adolphus, acknowledged the aid which Carteret provided him. On 17 October 1710 Carteret married Lady Frances Worsley at Longleat House. She was the granddaughter of the first Viscount Weymouth. One of their daughters, Georgiana Caroline Carteret Spencer, became the grandmother of Georgiana, Duchess of Devonshire, as well as an ancestor of Diana, Princess of Wales. Upon reaching his majority, Lord Carteret took his seat in the House of Lords on 25 May 1711. Though his family, on both sides, were devoted to the House of Stuart, Carteret was a steady adherent of the Hanoverian dynasty. 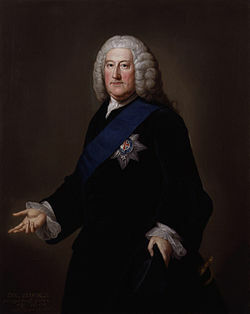 He was a friend of the Whig leaders Stanhope and Sunderland and supported the passing of the Septennial Act. Carteret’s interests were however in foreign, and not in domestic policy. His serious work in public life began with his appointment, early in 1719, as Ambassador to Sweden. During this and the following year he was employed in saving Sweden from the attacks of Peter the Great, and in arranging the pacification of the north. His efforts were finally successful. During this period of diplomatic work he acquired an exceptional knowledge of the affairs of Europe, and in particular of Germany, and displayed great tact and temper in dealing with the Swedish senate, with Queen Ulrica, with King Frederick IV of Denmark and King Frederick William I of Prussia. But he was not qualified to hold his own in the intrigues of Court and Parliament in London. Named Secretary of State for the Southern Department on his return home, he soon became helplessly in conflict with the intrigues of Townshend and Sir Robert Walpole. To Walpole, who looked upon every able colleague or subordinate as an enemy to be removed, Carteret was exceptionally odious. His capacity to speak German with the King would alone have made Sir Robert detest him. When, therefore, the violent agitation in Ireland against Wood’s halfpence made it necessary to replace the Duke of Grafton as Lord Lieutenant, Carteret was sent to Dublin. He landed in Dublin on 23 October 1724, and remained there till 1730. In the first months of his tenure of office he dealt with the furious opposition to Wood’s halfpence, and to counteract the effect of Swift’s Drapier’s Letters. The Lord Lieutenant had a strong personal liking for Swift, who was also a friend of Lady Carteret’s family. It is highly doubtful whether Carteret could have reconciled his duty to the crown with his private friendships, if government persisted in endeavouring to force the detested coinage on the Irish people. Wood’s patent was however withdrawn, and Ireland settled down. Carteret was a profuse and popular Lord Lieutenant who pleased both the English interest and the native Irish. He was at all times addicted to lavish hospitality, and according to the testimony of contemporaries was too fond of burgundy. Carteret inherited a one-eighth share in the Province of Carolina through his great-grandfather Sir George Carteret. In 1727 and 1728, John learned that the other inheritors of the original shares were planning to sell them back to the crown. Carteret declined to join them. After the others surrendered their claims in 1729, Carteret in 1730 agreed to give up any participation in government in order to keep ownership of his share. This share was later defined as a 60-mile wide strip of land in North Carolina adjoining the Virginia boundary, and became known as the Granville District. The lands of the Granville District remained in the Carteret family until the death of Carteret’s son Robert in 1776. Following the American Revolution, Robert’s heirs were compensated in part for the loss of the lands. Carteret County is a county located in the U.S. state of North Carolina. Its county seat is Beaufort. The county was created in 1722 as Carteret Precinct and gained county status in 1739. It was named for Sir George Carteret, one of the 17th century English Lords Proprietor, or for his descendant and heir John Carteret, 2nd Earl Granville. When Carteret returned to London in 1730, Walpole was firmly established as master of the House of Commons, and as the trusted Minister of King George II. Walpole also had the full confidence of Queen Caroline, whom he prejudiced against Carteret. Until the fall of Walpole in 1742, Carteret could take no share in public affairs except as a leader of opposition of the Lords. His brilliant parts were somewhat obscured by his rather erratic conduct, and a certain contempt, partly aristocratic and partly intellectual, for commonplace men and ways. He endeavoured to please Queen Caroline, who loved literature, and he has the credit, on good grounds, of having paid the expenses of the first handsome edition of Don Quixote to please her. He also involved himself in the establishment of the Foundling Hospital, a charity championed by the Queen, for which he became a founding Governor . But he reluctantly, and most unwisely, allowed himself to be entangled in the scandalous family quarrel between Frederick, Prince of Wales and his parents. Queen Caroline was provoked into classing Carteret and Bolingbroke, as “the two most worthless men of parts in the country”. Carteret took the popular side in the outcry against Walpole for not making war on Spain. When the War of the Austrian Succession approached, his sympathies were entirely with Maria Theresa—mainly on the ground that the fall of the house of Austria would dangerously increase the power of France, even if she gained no accession of territory. These views made him welcome to George II, who gladly accepted him as Secretary of State in 1742. In 1743 he accompanied the King to Germany, and was present at the Battle of Dettingen on 27 June 1743. He held the secretary-ship till November 1744. Carteret succeeded in promoting an agreement between Maria Theresa and Frederick II of Prussia. He understood the relations of the European states, and the interests of Great Britain among them. But the defects which rendered him unable to baffle the intrigues of Walpole made him equally unable to contend with the Pelhams. His support of the King’s policy was denounced as subservience to Hanover. Pitt called him “an execrable, a sole minister who renounced the British nation”. A few years later Pitt adopted an identical policy and professed that whatever he knew he learnt from Carteret. On 18 October 1744 Carteret became Earl Granville on the death of his mother. His first wife died on 20 June 1743 at Hanover, and in April 1744 he married Lady Sophia Fermor, daughter of Lord Pomfret and Henrietta Louisa Fermor—a fashionable beauty and “reigning toast” of London society, who was younger than his daughters. “The nuptials of our great Quixote and the fair Sophia” and Granville’s ostentatious performance of the part of lover were ridiculed by Horace Walpole. The Countess Granville died on 7 October 1745, leaving one daughter Sophia, who married William Petty, 2nd Earl of Shelburne, later 1st Marquess of Lansdowne. Granville’s second marriage may have done something to increase his reputation for eccentricity. In February 1746 he allowed himself to be entrapped by the intrigues of the Pelhams into accepting the secretaryship, but resigned in forty-eight hours. In June 1751 he became President of the Council, and was still liked and trusted by the King, but his share in government did not go beyond giving advice, and endeavouring to forward ministerial arrangements. In 1756 he was asked by Newcastle to become Prime Minister as the alternative to Pitt, but Granville, who perfectly understood why the offer was made, declined and supported Pitt. When in October 1761 Pitt, who held information of the signing of the “Family Compact” wished to declare war on Spain, and declared his intention to resign unless his advice was accepted, Granville replied that “the opinion of the majority (of the Cabinet) must decide”. He spoke in complimentary terms of Pitt, but resisted his claim to be considered as a “sole minister” or Prime Minister. Whether he used the words attributed to him in the Annual Register for 1761 is more than doubtful, but the minutes of Council show that they express his meaning. Robert Carteret, 3rd Earl Granville (b.21 Sep 1721, bap 17 Oct 1721 St Martin In The Fields, Westminster). Sophia Carteret, who married William Petty, 1st Marquess of Lansdowne and had issue. Granville remained in office as President of the Privy Council until his death. His last act was to listen while on his death bed to the reading of the preliminaries of the Treaty of Paris (1763). He was so weak that the Under-Secretary, Robert Wood, author of an essay on The Original Genius of Homer, would have postponed the business, but Granville said that it “could not prolong his life to neglect his duty”, and quoted the speech of Sarpedon from Iliad xii. 322-328, repeating the last word (iouee) “with a calm and determined resignation”. He died in his house in Arlington Street, London, on 02 January 1763. His remains were interred at Westminster Abbey. The title of Earl Granville descended to his son Robert, who died without issue in 1776, when the Earldom of this creation became extinct. John Carteret is depicted in the 2011 film Pirates of the Caribbean: On Stranger Tides by Anton Lesser. Information for this post comes from Encyclopedia Britannica, Wikipedia, and the North Carolina History Project. This entry was posted in British history, real life tales and tagged 2nd Earl Granville, John Carteret, North Carolina. Bookmark the permalink.